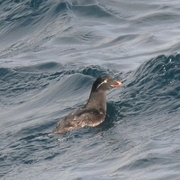 Alcids are diving seabirds of the Northern Hemisphere. Most are more comfortable in and under the water than in the air. While some members of the family fly long distances in post-breeding dispersal or migration, others fly only with effort. Underwater, they use their wings as flippers to swim after fish, krill, and other aquatic prey. The majority nest in colonies on islands, and many are active in these colonies only at night, spending the day foraging on open water far from their nesting sites. Many nest in burrows, and most species lay only one egg each year, although some lay two. Both sexes incubate and care for the young. Most alcids are predominantly black-and-white, with different breeding and non-breeding plumages. About a dozen records, February-April. Probably regular in winter in small numbers well offshore.